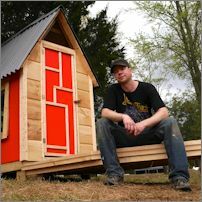 Derek “Deek” Diedricksen, is a blogger, designing, builder, and author of “Microshelters”, and “Humble Homes, Simple Shacks”, a former host/designer for HGTV and the DIY Network, and has been building tiny since the early 1990s. He specializes in salvaged/re-purposed design and construction, and has traveled “From Fargo to Sydney, Australia” teaching his hands-on workshops with his brother Dustin. In Turning Tiny Deek will attempt to make sense of how and why his one-man micro-cabin crusade has seen so much success.